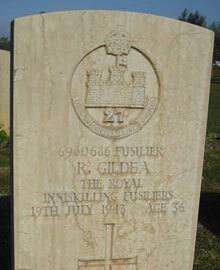 Fusilier Robert Gildea was born in 1907, and was the son of Robert & Esther Gildea, Cookstown, Co. Tyrone. Prior to enlistment Robert worked as a farm labourer. While in service he was ‘batman’ to Colonel Pennyfeather-Evans. Robert served with his cousin, Jim McCullough with the 2nd Royal Inniskilling Fusiliers in France before evacuation to Dunkirk, when they where then posted to Madagascar, India. The Battalion took part in the invasion of Sicily and mainland Italy. 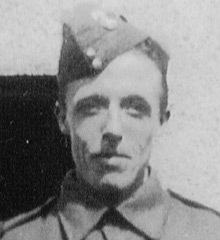 Fusilier Robert Gildea was killed in action at the Battle of Lemon Bridge, Sicily.